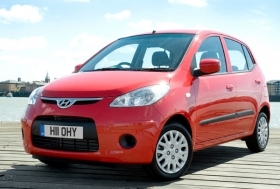 The Hyundai i10 competes against the Fiat Panda in Europe's minicar segment. SEOUL (Reuters) -- Production of the two key European models at Hyundai Motor Co.'s Indian plant was halted by a strike by workers, the Indian unit of the South Korean carmaker said on Monday, adding it was seeking government intervention. The factory makes the i10 minicar and i20 subcompact for Europe, India and other markets. Hyundai Motor India said in a statement some workers called for the strike demanding full re-instatement of dismissed employees, in violation of orders while conciliation on the issue is under way. The sit-in strike by about 150 workers had forced Hyundai Motor India management to suspend production, resulting in a loss of 2,200 cars on Monday, the company said. "The management is seeking government intervention and has also approached the commissioner of labor's office for an early settlement to the dispute," it said. Hyundai Motor, South Korea's top automaker, is the No. 2 brand in the fast-growing Indian market, competing with Maruti Suzuki. Its Indian plant produces employs about 10,000.